Alfa Laval ClipLine range is used in the same hygienic applications as the FontLine range, but ClipLine is used for smaller duties. ClipLine and FrontLine are premium ranges of heat exchangers used in dairy, food, beverage and other hygienic applications requiring gentle product treatment, long operating times or superior cleanability. Alfa Laval ClipLine has a flexible design with tailor-made plates for demanding hygienic applications. It is particularly useful for small duties or tests in small-scale laboratory rigs. The plate pattern and the pressing depth are designed for gentle, uniform heat transfer for sensitive dairy, food and beverage products. The glue-free gaskets are made with FDA-compliant materials which are easy to maintain and have a long service life. The frame is available for multi-section applications and is easy to disassemble for inspection, cleaning, and service. The connection plate corners are interchangeable and the heat transfer plates can easily be added or removed. This makes the ClipLine quick and easy to modify in the event that process conditions change. ClipLine is equipped with the Clip plate, which is designed for sensitive hygienic applications and uncompromising cleanliness. Clip plate has a chevron plate pattern designed for hygienic conditions. The entry points, the distribution area, and the shape and depth of the pressed plate pattern allow for optimal performance. Alfa Laval BaseLine is recommended for less demanding hygienic applications. Alfa Laval global service network is never far away. 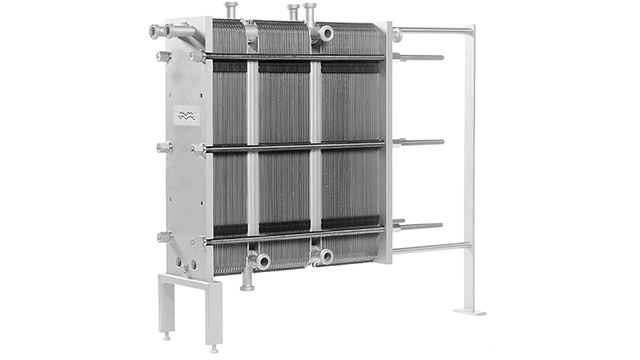 The heat transfer area of a gasketed plate-and-frame heat exchanger consists of a series of corrugated plates, assembled between the frame and pressure plates, which retain the design pressure. The sealing between the plates is made of gaskets. 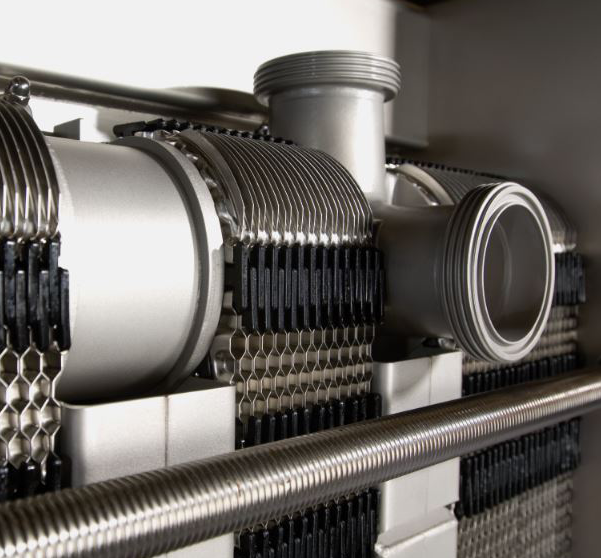 For the highest thermal performance and to enable a very close temperature approach, fluids normally run counter-currently through the heat exchanger. ClipLine’s plates are specifically designed for hygienic needs. The plate pattern, pressing depth, and the shape of the corrugation are all carefully designed and selected to achieve optimal performance. The chocolate pattern distribution area ensures that the fluids are evenly distributed across the entire plate to avoid stagnant zones that can result in fouling. High flow turbulence between plates results in higher heat transfer; however, the consequence is pressure drop. Our thermal design engineers will help you design and select the model and configuration that is suitable for your application needs while delivering maximum thermal performance and minimizing pressure drop.